We serve a full breakfast daily between 9:00 am and 10:00 am. The menu is chosen and freshly prepared by our innkeepers and typically consists of a hot entrée and fresh fruit. Plus, you can expect coffee, tea, and juice. When you make your reservation, please let us know if you have any special dietary needs. We want to know if you have any intolerances or allergies to ingredients, such as gluten or nuts. We also want to know if you are vegetarian or vegan. We will do our best to accommodate you. Forgot to mention it? Contact us today to communicate your dietary needs. 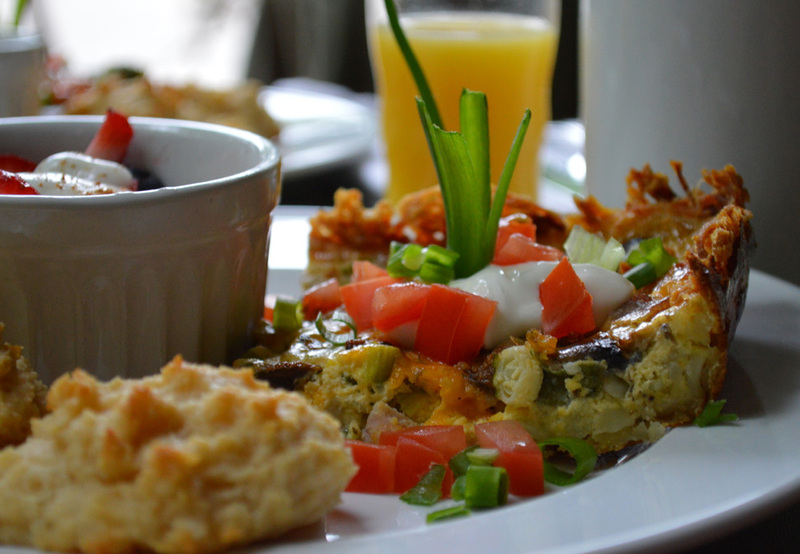 Hashbrown quiche with ham and local asparagus and cheddar cheese served with a made-from-scratch buttermilk biscuit and a bowl of fresh berries. Blueberry and cream cheese French toast casserole topped with a homemade blueberry sauce, all prepared with fresh Michigan blueberries. A side of sausage patties and fresh fruit completes the plate. Spinach and feta quiche topped with sundried tomatoes with a side of crispy bacon and a bowl of mixed fruit.